Type I IFNs are well established antiviral cytokines that have also been shown to be induced by bacteria. However, the signaling mechanisms regulating the activation of these cytokines during bacterial infections remain poorly defined. We show that although Gram-negative bacteria can activate the type I IFN pathway through TLR4, the intracellular Gram-positive bacterium Listeria monocytogenes (LM) can do so independently of TLR4 and TLR2. Furthermore, experiments using genetic mutants and chemical inhibitors suggest that LM-induced type I IFN activation occurs by an intracellular pathway involving the serine-threonine kinase TNFR-associated NF-κB kinase (TANK)-binding kinase 1 (TBK1). Interestingly, receptor-interacting protein 2, a component of the recently discovered nucleotide-binding oligomerization domain-dependent intracellular detection pathway, was not involved. Taken together, our data describe a novel signal transduction pathway involving TBK1 that is used by LM to activate type I IFNs. Additionally, we provide evidence that both the LM- and TLR-dependent pathways converge at TBK1 to activate type I IFNs, highlighting the central role of this molecule in modulating type I IFNs in host defense and disease. Type I IFNs have long been acclaimed for their role in antiviral host defense. A great deal of progress has been made in our understanding of how these cytokines are induced by viruses and the nature of the immune response that is triggered following type I IFN autocrine/paracrine signaling during an infection (1). The importance of type I IFNs is best exemplified by mice deficient in the type I IFN receptor that are extremely susceptible to infection by numerous types of viral pathogens (2). A collection of reports have also described the importance of type I IFNs in the production of both innate and adaptive immune effector cells, such as NK and activated CD8 T cells, respectively, in response to viral infections (3, 4). Recently, studies have demonstrated that, in opposition to their beneficial contributions in combating viruses, type I IFNs induced by the Gram-positive bacterium Listeria monocytogenes (LM)4 actually inhibit host immunity potentially through the induction of splenic apoptosis (5, 6, 7). Induction of type I IFN gene expression in response to both viral and bacterial infections is modulated by IFN regulatory factor (IRF) family members (8, 9, 10). IRF3 has been shown to be the earliest player, and normally exists in an unactivated state in the cytoplasm of most cell types. Upon detection of a viral or bacterial infection, IRF3 becomes activated by phosphorylation and subsequently participates in the transactivation of IFNβ. Once produced, secreted IFNβ acts in an autocrine/paracrine manner by binding to its receptor. This in turn results in the activation of transcriptional complexes involving STAT1, STAT2, IRF9, and IRF7, which up-regulate a large set of IFN inducible genes, including multiple IFN-α subtypes (11, 12). Although the precise mechanisms of viral and bacterial detection and triggering of the IRF3 pathway remain unclear, several advances have recently been made. TNFR-associated NF-κB kinase (TANK)-binding kinase 1 (TBK1) and I-κB kinase ε (IKKε) have been shown to be the critical kinases required for phosphorylation of IRF3 in response to viral infection (13, 14, 15, 16). In addition, studies in several laboratories including our own have linked activation of type I IFNs to TLRs, a family of receptors that recognize conserved molecular structures from pathogens (10, 17, 18). Specifically, TLR3, the receptor for double-stranded RNA, and TLR4, the receptor for LPS, could activate the type I IFN pathway by inducing the phosphorylation and nuclear translocation of IRF3 in a TBK1-dependent manner (16). Stimulation of TLR3 or TLR4 also inhibited replication of murine gammaherpesvirus 68, suggesting a potential role for these TLRs in antiviral host defense (19). In addition, TLR9, which recognizes hypomethylated DNA found in both bacteria and viruses, has also been shown to induce type I IFN in certain dendritic cell types (20). Although TLR3 and TLR4 require the adaptor molecule Toll-IL-1-receptor domain-containing adaptor-inducing IFN-β to up-regulate type I IFN (21), TLR9 is dependent on MyD88 (20). As type I IFNs are induced by LM leading to a disrupted innate immune response, we sought to investigate the mechanism by which LM up-regulates this pathway. Our studies indicate that type I IFN is triggered by LM independent of TLR4 and TLR2 signaling. Furthermore, induction of type I IFNs by LM was delayed in comparison to the Gram-negative bacterium Escherichia coli, which requires TLR4. Finally, we found that LM must enter the macrophage cytoplasm and activate IRF3 through a mechanism involving TBK1. Collectively, these findings suggest that LM activation of type I IFNs occurs through a TLR4-independent and novel cytoplasmic receptor system, which uses TBK1 to activate the type I IFN system. C57BL/6 mice age 6–12 wk were obtained from The Jackson Laboratory. TLR2−/−, TLR4−/− and wild-type control mice, all on a C57BL/6 genetic background, were a kind gift from Dr. S. Akira (Osaka University, Osaka, Japan). TBK1+/+TNFR1+/+, TBK1+/+TNFR1−/−, and TBK1−/−TNFR1−/− mice have been previously described (16). All mice, along with the receptor interacting protein (RIP) 2-deficient mice generated by our laboratory, were maintained and bred under specific pathogen-free conditions in the University of California (Los Angeles, CA), Department of Laboratory Animal Medicine mouse facility and experiments were conducted within the parameters of our approved protocol. Bacteria used in this study were the following: LM strain 10403S; E. coli strain K-12 (American Type Culture Collection catalog no. 10798); and Staphylococcus aureus strain 8325 (origin NCTC). Additional LM strains used were the following: the Δhly deletion mutant EJL1, and ΔactA deletion mutant EJL2. LM was grown in brain-heart infusion broth with 200 μg/ml streptomycin (BD Microbiology Systems). E. coli and S. aureus were both grown in lennox L broth base (Invitrogen Life Technologies). Bacteria were grown to mid-logarithmic phase, pelleted, washed, and resuspended in PBS three times, and stored as glycerol stocks at −80°C in small aliquots until use. The concentration of bacteria was quantified by plating serial dilutions on appropriate agar plates and counting colonies after growth at 37°C for 24–36 h.
Murine bone marrow-derived macrophages (BMDMs) were obtained by differentiating bone marrow. Briefly, bone marrow cells were flushed out of femurs and tibias, RBC were depleted and the remaining cells were maintained in macrophage differentiating medium (1× DMEM (Mediatech), 10% FBS, penicillin (100 U/ml), streptomycin (100 μg/ml), and 30% L929 conditioned medium) for 7 days. Approximately 96–99% of the differentiated macrophage cells were CD11b+ and negative for various contaminating markers. TBK1−/− immortalized fibroblast cells were a kind gift from W. C. Yeh (University of Toronto, Ontario, Canada) and were maintained in 1× DMEM, 10% FBS, penicillin (100 U/ml), and streptomycin (100 μg/ml). The chemical inhibitor concanamycin A (CNA) was obtained from Sigma-Aldrich. Cells were pretreated with the inhibitor at the indicated concentration for 30 min and for the entire length of the infection. Cells were fractionated and their nuclear and cytoplasmic portions were size fractionated. Detailed protocols are available on our laboratory website (〈www.mimg.ucla.edu/faculty/cheng/fac_cheng.html〉). The anti-IRF3 Ab was obtained from Zymed Laboratories, whereas both the anti-upstream stimulating factor (USF)-2 and anti-STAT1 Abs were obtained from Santa Cruz Biotechnologies. Finally the phospho-STAT1 Ab was purchased from Cell Signaling Technologies. RNA was isolated using the TRIzol Reagent (Invitrogen Life Technologies). RNA was quantitated and 1 μg of RNA was used to make cDNA templates using iScript per manufacturer’s suggested protocol (Bio-Rad). Q-PCR analyses were done using the iCycler thermocycler (Bio-Rad) as described (19). The following primers were used to amplify a specific 100–120 bp fragment of the following genes: IFN-β 5′-AGCTCCAAGAAAGGACGAACAT, IFN-β 3′-GCCCTGTAGGTGAGGTTGATCT; TNF-α 5′-GGTGCCTATGTCTCAGCCTCTT, TNF-α 3′-CGATCACCCCGAAGTTCAGTA; L32 5′-AAGCGAAACTGGCG GAAAC, L32 3′-TAACCGATGTTGGGCATCAG. All sample values have been normalized to their average L32 values and are presented as relative expression units. A number of studies have clearly demonstrated that type I IFNs can be induced by bacteria such as LM (9, 22, 23). To determine the relative abilities of different bacterial pathogens to induce the type I IFN system, we examined the response of primary murine BMDMs to infection by three types of bacteria: E. coli (Gram-negative, extracellular), LM (Gram-positive, intracellular) and S. aureus (Gram-positive, extracellular). Fig. 1⇓A shows that E. coli, a Gram-negative bacterium, is able to quickly induce nuclear translocation of IRF3, the transcription factor associated with initiation of the type I IFN response. We also found that the Gram-positive bacterium LM, but not S. aureus, induced a strong response. Of interest was the fact that LM activation of type I IFN was delayed and prolonged compared with E. coli. Translocation of p65, a component of the NF-κB pathway, was similar in response to all bacteria tested, and USF2 is shown as a loading control. Immunoblotting for phosphorylated STAT1 αβ (Fig. 1⇓B) confirmed that LM induced a potent but delayed activation of the type I IFN pathway relative to E. coli. 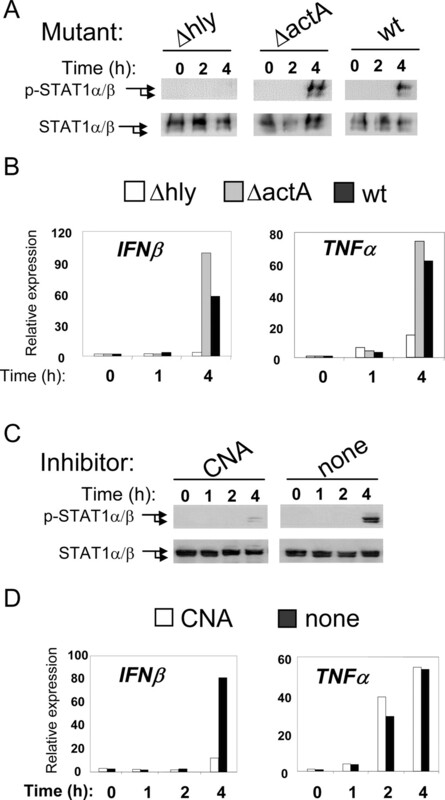 The dependency of STAT1 activation on type I IFN during an LM infection has been previously demonstrated by Stockinger et al. (23). Gene expression analysis using Q-PCR revealed that on a per bacterium basis, LM was the strongest inducer of IFN-β mRNA (Fig. 1⇓C). However, TNF-α mRNA was more potently induced by E. coli relative to LM (Fig. 1⇓C). LM is a relatively strong activator of type I IFN. BMDMs were infected with the indicated bacteria at a multiplicity of infection (MOI) of 1. At the indicated times, cells were harvested, fractionated, and (A) 40 μg of nuclear extract was analyzed by SDS-PAGE immunoblotting for IRF3 nuclear translocation followed by stripping and reprobing for p65 and USF2, or (B) 25 μg of cytoplasmic extract was analyzed by SDS-PAGE immunoblotting for phospho-STAT1 αβ. Total STAT1 αβ is shown as a loading control. C, BMDMs were infected as in A and RNA was harvested at the indicated time points. Gene expression was then analyzed by Q-PCR for IFN-β and TNF-α. All Q-PCR data are represented as relative expression units after normalization to L32 (see Materials and Methods). Measurements were conducted in triplicate and acceptable values were limited to a SD of <15% (data not shown). Results shown are representative of three independent experiments. Fig. 1⇑ demonstrates that LM induction of type I IFN follows different kinetics and reaches higher levels than those observed in E. coli infected cells. This pattern suggested to us that E. coli, a Gram-negative bacterium, might use distinct mechanisms to induce type I IFN expression from the Gram-positive bacterium LM. In an effort to identify the mechanism by which LM can activate the type I IFN system, we first analyzed the contribution of TLR4, which is found on the cell surface of BMDMs and can induce the expression of type I IFN in response to certain bacteria or bacterial products (24). We found that although IFN-β expression and subsequent STAT1 phosphorylation by BMDMs in response to E. coli was dependent upon TLR4 (Figs. 2⇓, A and B), induction of this pathway by LM remained intact in TLR4−/− BMDMs (Fig. 2⇓, C and D). 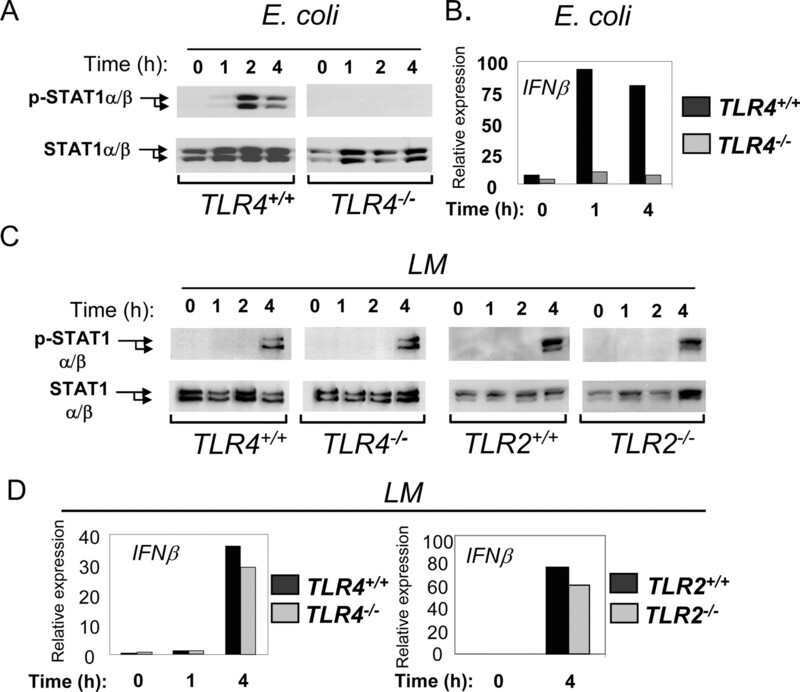 These findings reveal that although E. coli requires TLR4 to activate the type I IFN pathway, LM uses a unique, TLR4-independent mechanism. Activation of type I IFNs by LM is independent of TLR4 and TLR2. BMDMs from TLR4−/−, TLR2−/−, or littermate control mice were infected as described in Fig. 1⇑. At the indicated times, cells were harvested and analyzed for (A and C) phospho-STAT1 αβ or total STAT1 αβ by immunoblotting, and (B and D) gene expression by Q-PCR for IFN-β. Results shown are representative of two independent experiments. We next tested whether other TLRs might be involved in type I IFN production in response to LM. TLR2 has been shown to recognize molecular motifs found in Gram-positive bacteria, including LM. However, BMDMs deficient in TLR2 were still able to activate the type I IFN pathway, including IFN-β mRNA and STAT1 phosphorylation, in response to LM (Fig. 2⇑, C and D). This is consistent with in vitro studies indicating that TLR2 signaling does not induce expression of IFN-β in BMDMs (10). Additionally, BMDMs deficient in IL-1R-associated kinase 4 or TNFR-associated factor 6, both of which are components of the MyD88 signaling pathway (24), had no defects in type I IFN production in response to LM (data not shown). Although a facultative intracellular bacterium, LM must initially come into contact with cell surface and phagosomal surveillance molecules, such as TLR2 and TLR4, on its way into the cytoplasm. However, it is clear from our findings that these particular receptors are not required for activation of type I IFN in response to LM. These observations caused us to question whether the cellular detection of LM leading to type I IFN production was dependent upon an extracellular or cytosolic receptor(s). Evidence for a cytoplasmic receptor system has come from two independent studies showing that LM requires the hly gene to activate the type I IFN pathway in macrophages (22, 23). The hly gene encodes the protein listeriolysin O (LLO) that enables escape from the phagosome and entry into the cytoplasm. As expected, we also found that hly-deficient LM mutants were unable to activate the type I IFN response (Fig. 3⇓, A and B). Furthermore, a LM mutant deficient in actA, which can reach the cytoplasm but cannot polymerize actin, was able to induce type I IFNs to the same degree as wild-type LM. This demonstrates that actin polymerization by LM is not required for type I IFN induction. To further corroborate these findings, we examined whether LM can induce the type I IFN pathway in BMDMs that have been treated with the chemical inhibitor CNA, which prevents phagolysosomal acidification (25). Under these conditions, LM entry into the cytosol is disrupted (26), which we found to inhibit LM from inducing the type I IFN pathway (Fig. 3⇓, C and D). TNF-α mRNA was still induced normally in the presence of CNA (Fig. 3⇓D). These findings prompted us to shift our focus toward known intracellular pathways in the hopes of identifying a link of cytosolic origin between LM and type I IFN expression. Induction of type I IFNs by LM requires escape from the phagosome. BMDMs were infected with wild-type or mutant (actA or hly) LM. At the indicated times, cells were harvested and analyzed for phospho-STAT1 αβ (A) or total STAT1 αβ by immunoblotting, and gene expression (B) by Q-PCR for IFN-β (left) and TNF-α (right). BMDMs were infected with LM in the presence of the chemical inhibitor CNA (10 ng/ml). At the indicated times, cells were harvested and analyzed for phospho-STAT1 αβ (C) by immunoblotting, and gene expression (D) by Q-PCR for IFN-β and TNF-α. Results shown are representative of three independent experiments. The nucleotide-binding oligomerization domain (Nod) family of proteins has been shown to function as pattern recognition receptors that can detect and respond to conserved pathogenic motifs encountered within the cytoplasm (27). Following target binding, Nod1 and Nod2 signal through RIP2 (28). The importance of RIP2 in conferring immunity against LM is exemplified by a severe defect in LM clearance in mice deficient in the RIP2 gene (29). However, the involvement of the Nod1/2-RIP2 signaling pathway in type I IFN activation has not been studied. To decipher whether RIP2 is required for type I IFN production following infection with LM, we infected BMDMs deficient in RIP2. However, we found no impairment in IRF3 activation (Fig. 4⇓A), type I IFN production (Fig. 4⇓C) or STAT1 activation (Fig. 4⇓B) in RIP2-deficient cells. 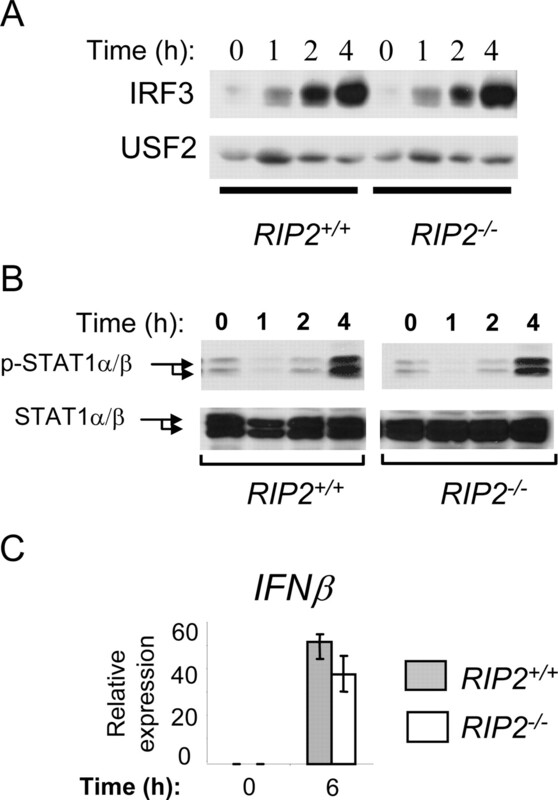 Up-regulation of type I IFNs by LM occurs independently of RIP2. BMDMs from RIP2−/− and wild-type mice were infected with LM at a multiplicity of infection of 1. At the indicated times, infected cells were harvested and analyzed for IRF3 nuclear translocation (A) followed by stripping and reprobing for p65 and USF2 and phospho-STAT1 αβ (B) or total STAT1 αβ by immunoblotting. C, IFN-β gene expression was assayed by Q-PCR. Results shown are representative of at least two independent experiments, and Q-PCR results are expressed in relative expression units and have been normalized to L32 mRNA levels. IRF3 has been shown to play a critical role in IFN-β production in response to TLR signaling, viral infection and infection by LM (8, 9, 10, 17). Furthermore, as indicated in Fig. 1⇑A, LM infection induces nuclear translocation of IRF3. As TBK1 has recently been implicated in IRF3 activation in response to viral infections and TLR signaling (15), we tested whether TBK1 is also involved in IRF3 activation leading to type I IFN production following infection with LM. We found that activation of IRF3 (Fig. 5⇓A), induction of type I IFN expression (Fig. 5⇓C) and activation of STAT1 (Fig. 5⇓B) by LM were all dependent upon TBK1 following LM infection in mouse embryonic fibroblasts (MEF) derived from TBK1-deficient mice and wild-type littermates. 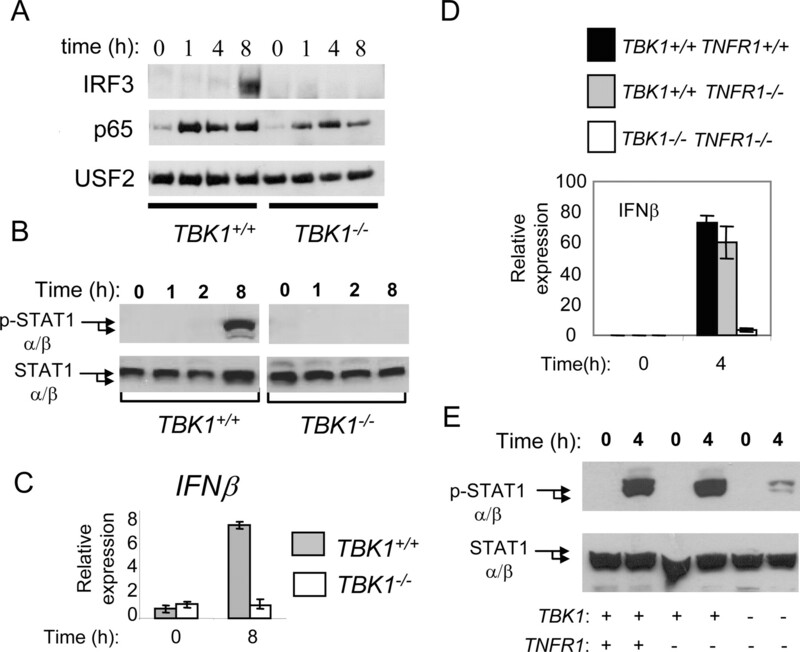 The specificity of the TBK1 defect in IRF3 activation and type I IFN production is demonstrated by the fact that nuclear translocation of the NF-κB subunit p65 is not dependent upon TBK1 (Fig. 5⇓A). Furthermore, we found that LM was able to replicate intracellularly in both wild-type and TBK1-deficient MEF (data not shown). MEF and BMDMs deficient in TBK1 exhibit a severe defect in type I IFN activation in response to infection by LM. TBK1+/+ and TBK1−/− immortalized fibroblasts were infected with LM at a multiplicity of infection of 25. At the indicated times, infected cells were harvested and nuclear IRF3 and p65 levels (A) were assayed, phosphorylated and total STAT1 levels (B) were determined, and gene expression (C) was assayed by Q-PCR. D, TBK1+/+TNFR1+/+, TBK1+/+TNFR1−/−, and TBK1−/−TNFR1−/− BMDMs were challenged with LM at a multiplicity of infection of 1 and IFN-β mRNA levels were assessed by Q-PCR at the indicated times, or phosphorylated or total STAT1 levels (E) were assessed by immunoblotting. Results shown are representative of at least two independent experiments, and Q-PCR results are expressed in relative expression units and have been normalized to L32 mRNA levels. Deletion of TBK1 in mice has been shown to be embryonic lethal (30). To assess whether TBK1 is required for primary macrophage induction of type I IFNs following infection by LM, we used BMDMs from mice deficient in both TBK1 and TNFR1 (16). Following a LM challenge, we found that TBK1−/−TNFR1−/− BMDMs also had a drastic, although not complete, defect in both IFN-β mRNA up-regulation and STAT1 phosphorylation compared with both wild-type and TBK1+/+TNFR1−/− controls (Fig. 5⇑, D and E). These data indicate that TBK1 is required for proper LM induction of type I IFNs in multiple cell types. Much attention has been given to the study of TLR recognition of bacterial pathogens leading to induction of numerous target genes, including type I IFNs. However, our current findings provide strong evidence that TLR4 and TLR2 are not involved in LM-mediated type I IFN production in macrophage cells (Fig. 6⇓). Furthermore, although the muramyl dipeptide component of peptidoglycan found in Gram-positive bacteria has been shown to signal through the Nod2/RIP2 cytoplasmic pathway, we found that RIP2 was also dispensable for type I IFN induction in response to LM. However, it is evident that induction of type I IFNs by LM involves both cytoplasmic penetrance as well as signaling through TBK1. Hypothetical model of the innate immune signaling pathways activated by LM. Initial detection of LM by TLRs results in TNF-α production and inflammation. LM escape from the phagosome triggers two separate pathways. RIP2 is critical for a proper innate response to LM and not involved in type I IFN production. However, through an unknown cytoplasmic receptor, LM activates TBK1 leading to IRF3 transactivation of type I IFNs. Although the MyD88 and RIP2 pathways play a host protective role, LM induced type I IFNs lead to decreased host immunity most likely through the induction of host immune effector cell apoptosis. The mechanism responsible for type I IFN induction by LM has many similarities to that used by viruses. For instance, both are intracellular pathogens that require TBK1 to activate IRF3 (13, 15). As has been demonstrated for viruses, IKKε, which is expressed in BMDMs but not MEFs (16), can likely play a partially redundant role in activating the type I IFN system following infection by LM. This might explain why we still observe slight induction of IFN-β and activation of STAT1 in TNFR1−/−TBK1−/− BMDMs. Furthermore, the kinetics of type I IFN production following infection with either LM or viruses are delayed in comparison to type I IFNs produced in response to Gram-negative bacteria, such as E. coli (10, 31). Our findings also clearly demonstrate that although E. coli uses a TLR4-dependent mechanism to induce type I IFN expression within 1 h of macrophage challenge, LM does not require TLR4 and reaches maximal induction by 4 h. These data are consistent with recent observations that macrophages deficient in Toll-IL-1-receptor domain-containing adaptor-inducing IFN-β, the adaptor that allows TLR3 and TLR4 activation of type I IFNs, can still produce type I IFNs in response to LM (5). Collectively, these observations indicate that host production of type I IFNs in response to bacterial pathogens can occur via at least two independent receptor systems. There are thus far two innate immune signaling pathways that appear to play nonredundant roles in combating infection by LM. These pathways include RIP2 (29) and MyD88 (32, 33). RIP2 is involved in the activation of NF-κB in macrophages and IFN-γ production in both Th1 and NK cells (29). As the Th1 response is critical in combating LM, it is not surprising that mice deficient in RIP2 are extremely sensitive to infection by this pathogen. Mice deficient in MyD88 have been shown to have severe defects in the production of proinflammatory cytokines, such as TNF-α, in response to a LM challenge in vivo (32, 33). As a result, these mice are also very susceptible to infection by LM. A recent study by Way et al. (34) has shown that MyD88 is not required for the adaptive immune response against LM. These findings provide evidence that MyD88 is important in the early inflammatory response (32, 33). As type I IFNs have recently been shown to play an opposite role from MyD88 and RIP2 and inhibit the immune response to LM, it is not surprising that these two pathways are not involved in the induction of type I IFNs (9). Additional studies are still required to further clarify the molecular process by which LM is able to activate IRF3 once inside the cytoplasm. Although this mechanism requires LLO, a recent study has found that purified LLO alone is not sufficient to induce type I IFNs in macrophages. These observations support the hypothesis that type I IFN activation is driven by a cytosolic surveillance system that can detect the presence of certain bacteria and is not simply induced by LLO alone (35). In addition to identifying host proteins that participate in the recognition of LM and subsequent activation of signaling cascades leading to TBK1, it will be of importance to identify which LM component is serving as a ligand for the unknown host cytosolic receptor. Because LM induction of the type I IFN pathway plays a negative role in host defense against this opportunistic pathogen, a clear understanding of the mechanism by which LM can induce these cytokines is imperative. Such information should enable the design of strategic molecular interventions to combat the deleterious effects on the mammalian host following infection by bacterial pathogens such as LM. We thank Dr. S. Akira (Osaka University, Osaka, Japan) for the gift of TLR4−/− and TLR2−/− mouse lines and W. C. Yeh (University of Toronto, Ontario, Canada) for the TBK1−/− immortalized fibroblast cell line. ↵1 This work was supported in part by the National Institutes of Health research Grants R01 AI056154, R01 CA87924, and R01 AI052359. R.M.O. is supported by the U.S. Public Health Service National Research Service Award GM 07185. S.A.V. and S.K.S. are supported by the University of California Los Angeles Medical Scientist Training Program training Grant GM 08042. A.P. is supported by the Howard Hughes Medical Institute predoctoral fellowship (No. 59003787). ↵2 R.M.O. and S.A.V. contributed equally to this work. ↵4 Abbreviations used in this paper: LM, Listeria monocytogenes; BMDM, bone marrow-derived macrophage; CNA, concanamycin A; IKKε, I-κB kinase ε; IRF, IFN regulatory factor; Q-PCR, quantitative real-time PCR; Nod2, nucleotide-binding oligomerization domain 2; LLO, listeriolysin O; RIP, receptor interacting protein; TANK, TNFR-associated NF-κB kinase; TBK1, TANK-binding kinase 1; MEF, mouse embryonic fibroblast; USF, upstream stimulating factor. Biron, C. A.. 2001. Interferons α and β as immune regulators: a new look. Immunity 14:661. Muller, U., U. Steinhoff, L. F. Reis, S. Hemmi, J. Pavlovic, R. M. Zinkernagel, M. Aguet. 1994. Functional role of type I and type II interferons in antiviral defense. Science 264:1918. Nguyen, K. B., T. P. Salazar-Mather, M. Y. Dalod, J. B. Van Deusen, X. Q. Wei, F. Y. Liew, M. A. Caligiuri, J. E. Durbin, C. A. Biron. 2002. Coordinated and distinct roles for IFN-αβ, IL-12, and IL-15 regulation of NK cell responses to viral infection. J. Immunol. 169:4279. Zhang, X., S. Sun, I. Hwang, D. F. Tough, J. Sprent. 1998. Potent and selective stimulation of memory-phenotype CD8+ T cells in vivo by IL-15. Immunity 8:591. Auerbuch, V., D. G. Brockstedt, N. Meyer-Morse, M. O’Riordan, D. A. Portnoy. 2004. Mice lacking the type I interferon receptor are resistant to Listeria monocytogenes. J. Exp. Med. 200:527. Carrero, J. A., B. Calderon, E. R. Unanue. 2004. Type I interferon sensitizes lymphocytes to apoptosis and reduces resistance to Listeria infection. J. Exp. Med. 200:535. O’Connell, R. M., S. K. Saha, S. A. Vaidya, K. W. Bruhn, G. A. Miranda, B. Zarnegar, A. K. Perry, B. O. Nguyen, T. F. Lane, T. Taniguchi, J. F. Miller, G. Cheng. 2004. Type I interferon production enhances susceptibility to Listeria monocytogenes infection. J. Exp. Med. 200:437. Taniguchi, T., K. Ogasawara, A. Takaoka, N. Tanaka. 2001. IRF family of transcription factors as regulators of host defense. Annu. Rev. Immunol. 19:623. O’Connell, R., S. Saha, S. Vaidya, K. Bruhn, G. A. Miranda, B. Zarnegar, A. K. Perry, B. Nguyen, T. F. Lane, T. Taniguchi, J. F. Miller, G. Cheng. 2004. Type I interferon production enhances susceptibility to Listeria monocytogenes infection. J. Exp. Med. 200:1. Doyle, S., S. Vaidya, R. O’Connell, H. Dadgostar, P. Dempsey, T. Wu, G. Rao, R. Sun, M. Haberland, R. Modlin, G. Cheng. 2002. IRF3 mediates a TLR3/TLR4-specific antiviral gene program. Immunity 17:251. Bromberg, J., J. E. Darnell, Jr. 2000. The role of STATs in transcriptional control and their impact on cellular function. Oncogene 19:2468. Taniguchi, T., A. Takaoka. 2002. The interferon-αβ system in antiviral responses: a multimodal machinery of gene regulation by the IRF family of transcription factors. Curr. Opin. Immunol. 14:111. Fitzgerald, K. A., S. M. McWhirter, K. L. Faia, D. C. Rowe, E. Latz, D. T. Golenbock, A. J. Coyle, S. M. Liao, T. Maniatis. 2003. 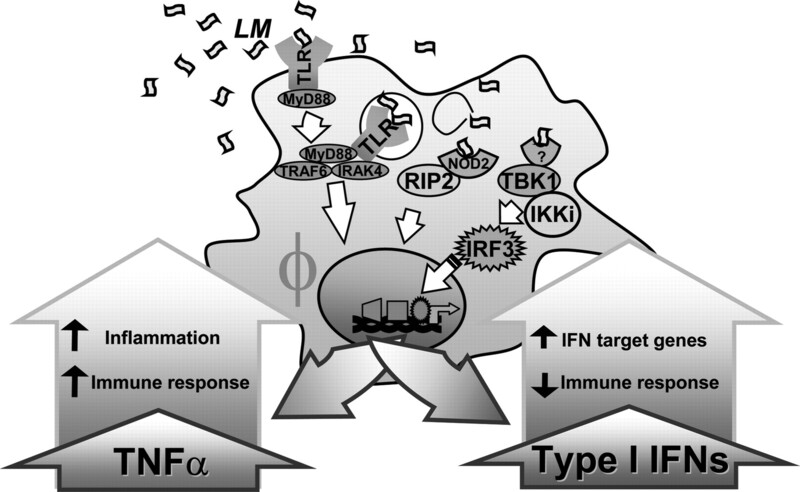 IKKε and TBK1 are essential components of the IRF3 signaling pathway. Nat. Immunol. 4:491. Pomerantz, J. L., D. Baltimore. 1999. NF-κB activation by a signaling complex containing TRAF2, TANK and TBK1, a novel IKK-related kinase. EMBO J. 18:6694. Sharma, S., B. R. tenOever, N. Grandvaux, G. P. Zhou, R. Lin, J. Hiscott. 2003. Triggering the interferon antiviral response through an IKK-related pathway. Science 300:1148. Perry, A. K., E. K. Chow, J. B. Goodnough, W. C. Yeh, G. Cheng. 2004. Differential requirement for TANK-binding kinase-1 in type I interferon responses to Toll-like receptor activation and viral infection. J. Exp. Med. 199:1651. Kawai, T., O. Takeuchi, T. Fujita, J. Inoue, P. F. Muhlradt, S. Sato, K. Hoshino, S. Akira. 2001. Lipopolysaccharide stimulates the MyD88-independent pathway and results in activation of IFN-regulatory factor 3 and the expression of a subset of lipopolysaccharide-inducible genes. J. Immunol. 167:5887. Toshchakov, V., B. W. Jones, P. Y. Perera, K. Thomas, M. J. Cody, S. Zhang, B. R. Williams, J. Major, T. A. Hamilton, M. J. Fenton, S. N. Vogel. 2002. TLR4, but not TLR2, mediates IFN-β-induced STAT1α/β-dependent gene expression in macrophages. Nat. Immunol. 3:392. Doyle, S. E., R. O’Connell, S. A. Vaidya, E. K. Chow, K. Yee, G. Cheng. 2003. Toll-like receptor 3 mediates a more potent antiviral response than Toll-like receptor 4. J. Immunol. 170:3565. Hoshino, K., T. Kaisho, T. Iwabe, O. Takeuchi, S. Akira. 2002. Differential involvement of IFN-β in Toll-like receptor-stimulated dendritic cell activation. Int. Immunol. 14:1225. Yamamoto, M., S. Sato, H. Hemmi, K. Hoshino, T. Kaisho, H. Sanjo, O. Takeuchi, M. Sugiyama, M. Okabe, K. Takeda, S. Akira. 2003. Role of adaptor TRIF in the MyD88-independent Toll-like receptor signaling pathway. Science 301:640. O’Riordan, M., C. H. Yi, R. Gonzales, K. D. Lee, D. A. Portnoy. 2002. Innate recognition of bacteria by a macrophage cytosolic surveillance pathway. Proc. Natl. Acad. Sci. USA 99:13861. Stockinger, S., T. Materna, D. Stoiber, L. Bayr, R. Steinborn, T. Kolbe, H. Unger, T. Chakraborty, D. E. Levy, M. Muller, T. Decker. 2002. 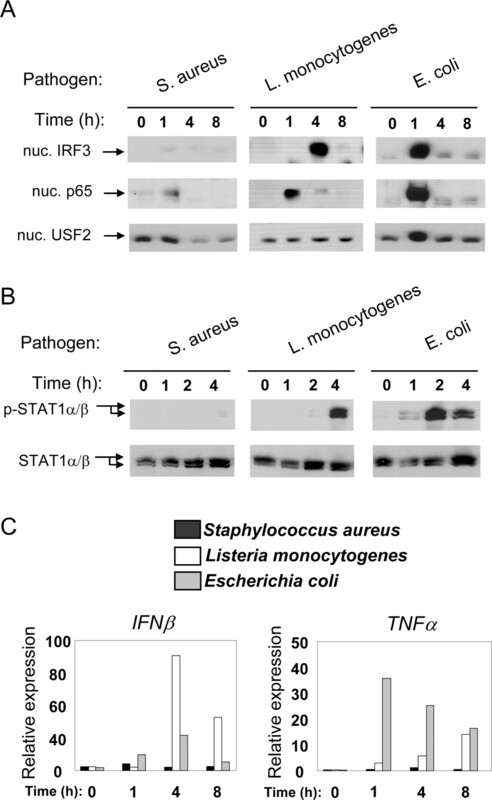 Production of type I IFN sensitizes macrophages to cell death induced by Listeria monocytogenes. J. Immunol. 169:6522. Medzhitov, R., C. Janeway, Jr. 2000. The Toll receptor family and microbial recognition. Trends Microbiol. 8:452. Kataoka, T., N. Shinohara, H. Takayama, K. Takaku, S. Kondo, S. Yonehara, K. Nagai. 1996. Concanamycin A, a powerful tool for characterization and estimation of contribution of perforin- and Fas-based lytic pathways in cell-mediated cytotoxicity. J. Immunol. 156:3678. Portnoy, D. A., V. Auerbuch, I. J. Glomski. 2002. The cell biology of Listeria monocytogenes infection: the intersection of bacterial pathogenesis and cell-mediated immunity. J. Cell Biol. 158:409. Inohara, N., G. Nunez. 2003. NODs: intracellular proteins involved in inflammation and apoptosis. Nat. Rev. Immunol. 3:371. Kobayashi, K., N. Inohara, L. D. Hernandez, J. E. Galan, G. Nunez, C. A. Janeway, R. Medzhitov, R. A. Flavell. 2002. RICK/Rip2/CARDIAK mediates signalling for receptors of the innate and adaptive immune systems. Nature 416:194. Chin, A. I., P. W. Dempsey, K. Bruhn, J. F. Miller, Y. Xu, G. Cheng. 2002. Involvement of receptor-interacting protein 2 in innate and adaptive immune responses. Nature 416:190. Bonnard, M., C. Mirtsos, S. Suzuki, K. Graham, J. Huang, M. Ng, A. Itie, A. Wakeham, A. Shahinian, W. J. Henzel, et al 2000. Deficiency of T2K leads to apoptotic liver degeneration and impaired NF-κB-dependent gene transcription. EMBO J. 19:4976. Sato, M., H. Suemori, N. Hata, M. Asagiri, K. Ogasawara, K. Nakao, T. Nakaya, M. Katsuki, S. Noguchi, N. Tanaka, T. Taniguchi. 2000. Distinct and essential roles of transcription factors IRF-3 and IRF-7 in response to viruses for IFN-α/β gene induction. Immunity 13:539. Seki, E., H. Tsutsui, N. M. Tsuji, N. Hayashi, K. Adachi, H. Nakano, S. Futatsugi-Yumikura, O. Takeuchi, K. Hoshino, S. Akira, J. Fujimoto, K. Nakanishi. 2002. Critical roles of myeloid differentiation factor 88-dependent proinflammatory cytokine release in early phase clearance of Listeria monocytogenes in mice. J. Immunol. 169:3863. Edelson, B. T., E. R. Unanue. 2002. MyD88-dependent but Toll-like receptor 2-independent innate immunity to Listeria: no role for either in macrophage listericidal activity. J. Immunol. 169:3869. Way, S. S., T. R. Kollmann, A. M. Hajjar, C. B. Wilson. 2003. Cutting edge: protective cell-mediated immunity to Listeria monocytogenes in the absence of myeloid differentiation factor 88. J. Immunol. 171:533. McCaffrey, R. L., P. Fawcett, M. O’Riordan, K. D. Lee, E. A. Havell, P. O. Brown, D. A. Portnoy. 2004. A specific gene expression program triggered by Gram-positive bacteria in the cytosol. Proc. Natl. Acad. Sci. USA 101:11386.